Nuts and seeds make tasty snacks. If you're afraid to eat them because of their high caloric content, you may want to reconsider, as they may help keep your weight in check. The fiber and fat in foods like almonds and sunflower seeds might help you eat fewer calories, according to registered dietitian Lisa Young in an article on the Huffington Post website. Knowing the nutritional value of almonds and sunflower seeds can help you determine how they fit into your healthy diet plan. Although almonds and sunflower seeds are a healthy source of calories, they are a concentrated source of calories. Eating more calories than you need, even from nutritious sources, can lead to weight gain. Limit your portion size to keep calories under control. As far as calories go, almonds are slightly higher than the sunflower seeds. A 1-ounce serving of blanched almonds contains 167 calories, versus 161 calories in the same serving of sunflower seeds. Like calories, the almonds and sunflower seeds also contain about the same amount of carbohydrates and fiber. 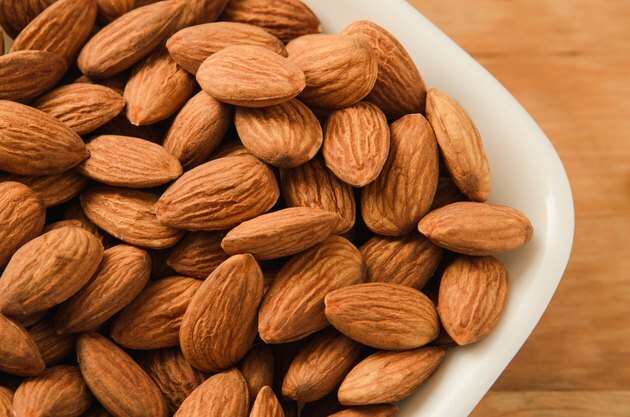 A 1-ounce serving of almonds contains 6 grams of carbohydrates and 3 grams of fiber, while the same serving of sunflower seeds contains 5 grams of carbohydrates and 3 grams of fiber. In addition to helping control your hunger for better weight management, the fiber in the almonds and sunflower seeds may also reduce your risk for both Type 2 diabetes and cardiovascular disease. Both almonds and sunflower seeds are a good source of protein and heart-healthy unsaturated fats. A 1-ounce serving of either the almonds or sunflower seeds contains 6 grams of protein and 14 grams of total fat. While they both contain the same amount of total fat, their fat composition differs. The almonds are higher in monounsaturated fats, while the sunflower seeds contain more polyunsaturated fats. When used to replace saturated fats, both of these unsaturated fats do your heart good by helping lower cholesterol levels. When it comes to vitamins and minerals, sunflower seeds tend to be a slightly better source of vitamin E, zinc, iron and magnesium than almonds. Vitamin E is a fat-soluble vitamin known best for its antioxidant properties. Zinc is a mineral that helps your body heal cuts. Iron helps carry the oxygen from your lungs to the rest of your body. Magnesium helps make protein, and is needed for the regulation of blood sugar and blood pressure.